3 Is the Umbrella Tree Toxic? Schefflera plant, also called umbrella tree, is a fantastic houseplant and landscape plant. It’s known for being hardy even in cases of neglect or poor growing conditions. Not picky, it produces beautiful foliage. 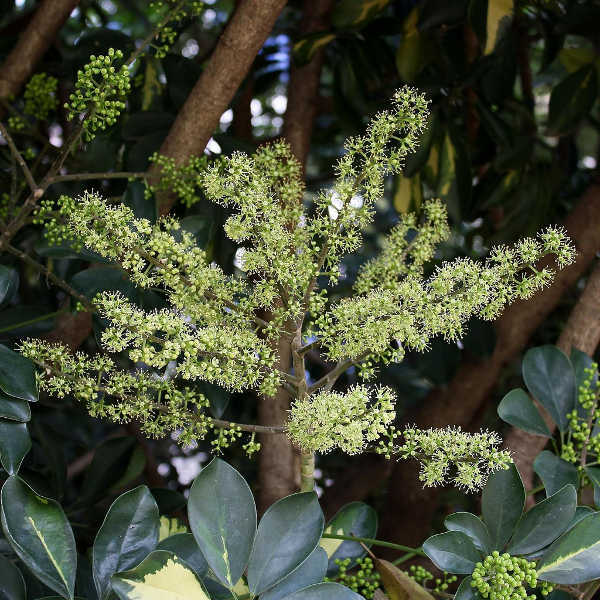 Whether it’s used to create bonsai or simply to perk up a dark corner, dwarf umbrella trees are great to grow. 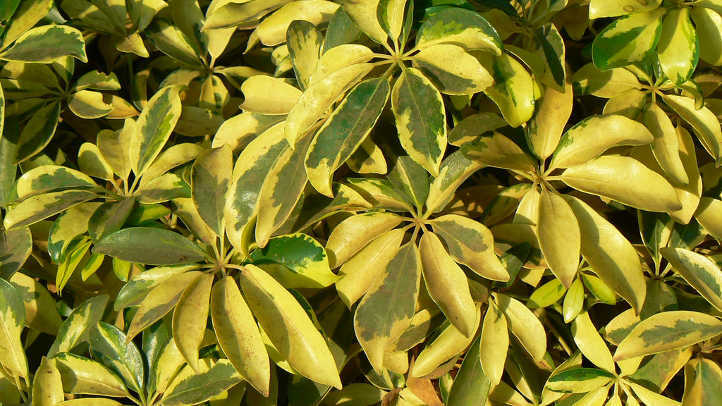 Let’s go over the history of this fantastic plant and all the best schefflera plant care tips! Pests Red spider mites, mealybugs, other scale insects, aphids, thrips. Also susceptible to fungal leaf spot diseases (alternaria and phytophthora), sooty mold, pseudomonas leaf blight, xanthomonas leaf spot, fungal stem or root rots. A member of the ginseng family, umbrella tree leaves grow in an unusual fashion. Long, oval-shaped and pointy-tipped, the leaves grow in circular groups of 5-9 leaves. This gives them an umbrella-like look, hence their name! There’s literally hundreds of Schefflera species in existence. 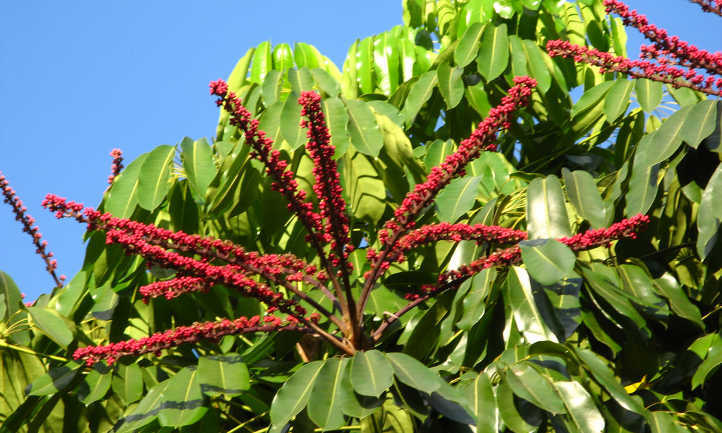 Of these, only two are usually referred to as “umbrella tree”. These two, schefflera arboricola and schefflera actinophylla, are very closely related. How do you distinguish the two? It’s all about the size. Actinophylla plants usually have leaves which are longer than 4-5 inches. Arboricola tends to a dwarfing habit, and has leaves 4-5 inches or smaller in length. There are many cultivars available of dwarf umbrella tree. Some have variegated leaf coloring. Others are all-green in coloration. It seems that schefflera arboricola tends more to the variegated side. By contrast, most of the schefflera actinophylla species tend to lean towards green. The multicolored or variegated varieties are far less common in this plant type. It grows to much larger sizes. 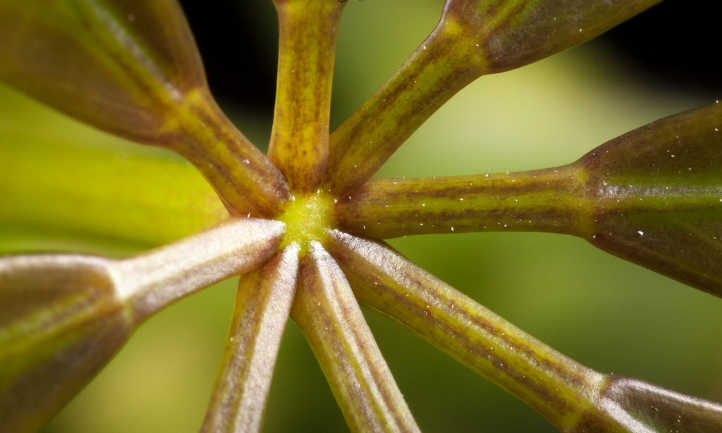 During the summer months, most schefflera arboricola plants will develop flower spikes. These spikes aren’t showy, often greenish-white or cream in color, and they stay fairly compact. Schefflera actinophylla flower spikes are the origin of the “octopus plant” name. Their spikes group in clusters that hang down from the tip of branches. Colors of red, pink, or white are common, and they’re believed to look like the underside of tentacles. In both cases, the flowers gradually turn into bright orange berries. These round fruit are flashy to look at, but are inedible. Grown indoors, most scheffleras can be trained to smaller sizes. The dwarf umbrella tree can be as small as 8-10″ in height in a bonsai arrangement, or grown up to 4-5 feet. Actinophylla tends to be larger in size, growing to reach heights of 6-8 feet indoors. Outdoor growers in warm climates like Hawaii, Florida or southern California have a benefit. These climates are great for dwarf scheffleras, and your plants will explode in size as a result. Arboricolas can reach heights of 10-15 feet grown outdoors. Actinophylla growers can develop even more immense trees. In their natural environment in Australia and New Guinea, these can reach up to 50′ in height! Be careful, though: in zones 10-11, these can be aggressive growers. Some parts of Florida and Hawaii consider them invasive. Is the Umbrella Tree Toxic? While they make fantastic indoor trees, schefflera plants develop calcium oxalate crystals. These crystals tend to be a major irritant both to people and to animals. Most people have limited issues with skin irritation. On rare occasions, it may cause an itchy rash, but most people seem to be unharmed. For safety’s sake, I still recommend using a quality pair of work gloves when you’re pruning. Wash thoroughly if you get any sap on you. 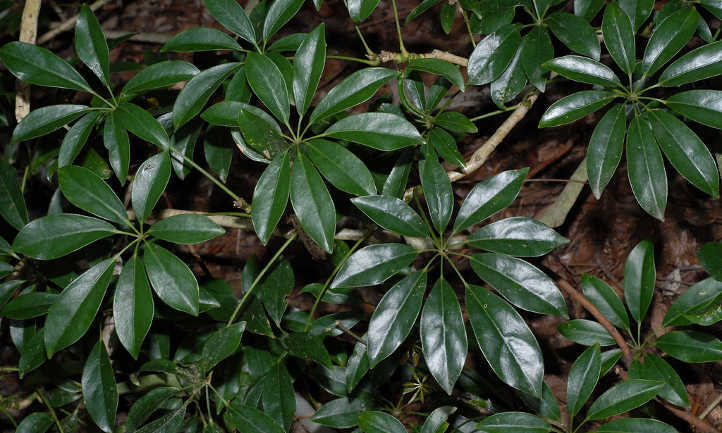 For some animals, this plant may be fatal The ASPCA lists schefflera species as toxic to cats and dogs. They’re also potentially dangerous to reptiles. For humans, they won’t generally kill you, but you might wish otherwise while suffering their effects. 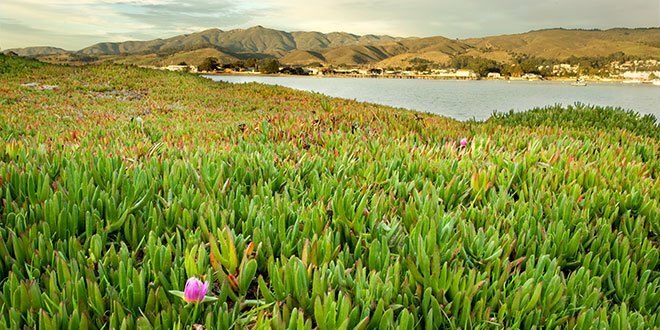 While it’s beautiful, it’s best to watch your kids and pets around this plant. It can be a wonderful houseplant, but you don’t need the emergency trip to the doctor or vet! Overall, care of schefflera arboricola is pretty easy. It doesn’t need any kind of special care to survive — just the basics will do. 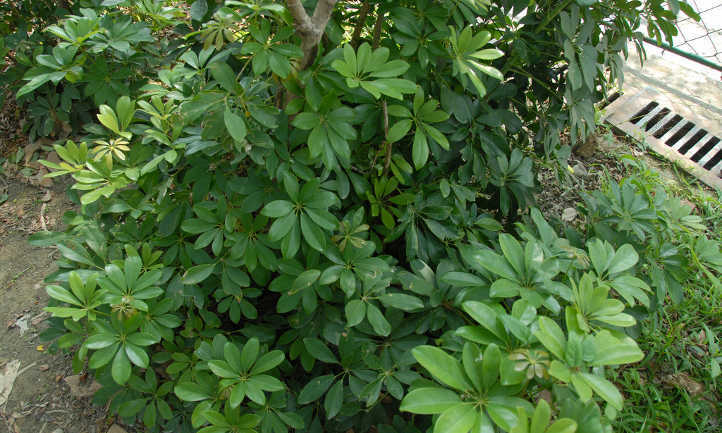 Depending on which schefflera you’re growing, it varies a bit in its lighting. Let’s look at some detail on that! Schefflera arboricola grows well in USDA zones 9b-11. It prefers bright, indirect lighting to full sun. It can tolerate full sun for limited periods, but does best during the heat of the day in partial shade. Schefflera actinophylla does best in zones 10-11. Like arboricola it prefers a partial shade environment. Older, larger plants can tolerate more sunlight than younger plants. For indoor growers, aim for positioning your plant near windows that get a good amount of sun. Variegated varieties require more light than green varieties do. If the leaves start to droop, it may need more light. Sunlight that’s too direct may cause the leaves to get sunburned. This isn’t as much a problem for houseplants as it is for outdoor plants. Try to give your plant at least some shade during the hottest parts of the day, especially in summer. Aim for a general temperature range of 60-80 degrees for your umbrella trees. Outdoor plants are not reliably winter-hardy. In their natural environment, it rarely drops below 55 degrees. 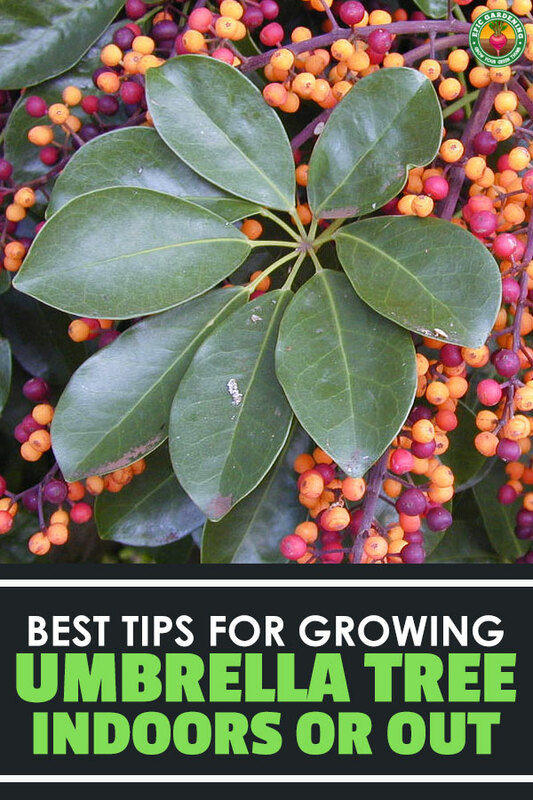 If you’ll be growing umbrella tree outdoors, consider moving it inside for the winter. In their natural environment, umbrella trees are drought-tolerant. They can withstand a little neglect when it comes to watering. Their soil shouldn’t be kept wet, and the pot needs to drain well. Use room-temperature water for watering your plant when possible. This creates less of a temperature shock for your tropical plants. Ideally, wait until the soil is nearly dry to water. 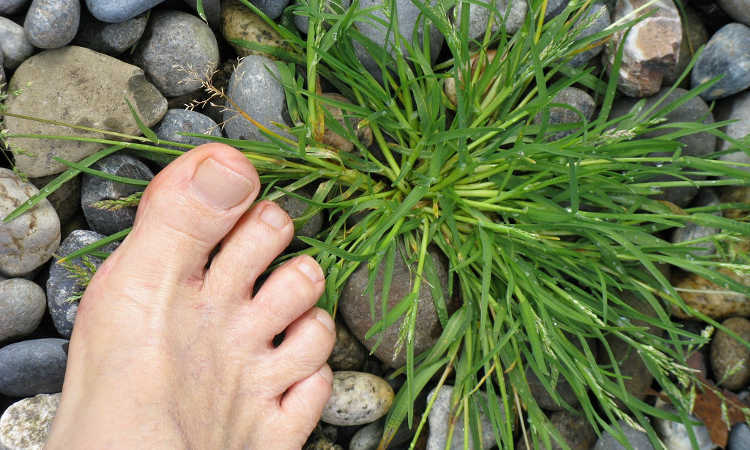 Poke your finger into the soil to test — if it seems dry rather than moist, it’s time. At that point, give it a good, thorough watering until water begins to come out the base of the pot. Be sure not to allow any standing water to remain in the pot, and drain any saucers under the plant. Blackened leaves are a sign of overwatering. Wrinkled or wilting leaves signify underwatering. Try to avoid both! Reduce watering during the winter months. Your plant just won’t need as much then. Your umbrella trees come from a naturally-humid environment. They love moist air, and you can provide that indoors with a plant humidifier. Occasional misting of the leaves with warm water is fine too. Keep your schifflera plant out of the path of air vents, heaters, and air conditioners. These can create much drier air, and your plant may not like it. Your umbrella tree will perform best in a well-drained, sandy potting soil. You can use a general purpose potting soil as well, but add perlite or sand to improve drainage. A basic homemade potting mix for schiffleras is easy to make. Use one part perlite or coarse sand, one part humus or peat, one part garden soil, and a pinch of agricultural lime. Blend together well. The pH level of your soil should be in the acidic to slightly alkaline range. An optimal range would be 6.0-6.5 pH. 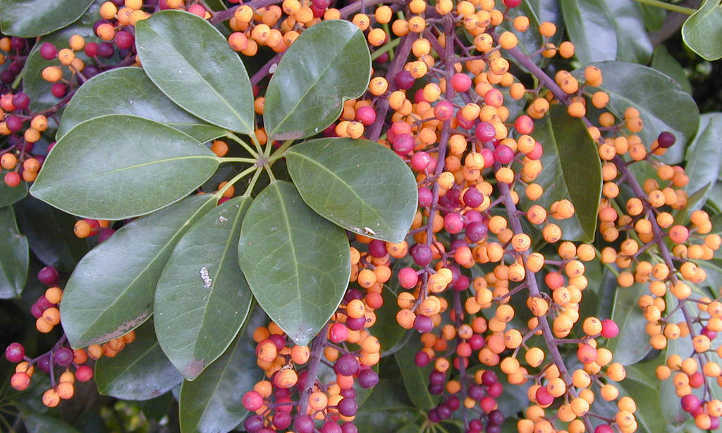 During the winter, you don’t need to fertilize your schifflera plants at all. But once they go into the active growing mode in spring, that changes. Depending on the size you’re trying to grow your plant to, you may need more or less fertilizer. I recommend using a balanced liquid houseplant fertilizer. Even better would be one optimized for foliage plants. From late February through the end of fall, fertilize your umbrella tree at least once per month. If you’re trying to encourage more vigorous growth, you can fertilize every other week. Your umbrella plant needs to be repotted every 2-3 years. Usually you’ll know well in advance. Roots may be visible growing out of the pot. It may show signs of stunted growth, or the soil will appear to have dwindled away to nothing. Select a pot with a heavy base. This helps keep the tree from tipping over if its foliage encounters wind. You’ll want one that’s at least 2-3″ wider than your existing pot. Remove your plant from its prior pot. Check the roots for signs of rot, and then replant at its prior height in its new pot. It’s good to replace the old potting soil with new at this point. Skip 1-2 fertilizing sessions after repotting, as your plant should have enough nutrition in its new soil. Umbrella trees love to be pruned, and they’ll grow back quickly. Try to make your cuts above a leaf node to encourage more bushy growth. It’s important to prune if you want to prevent your schifflera from becoming too large. It doesn’t matter if you’re growing dwarf schifflera arboricola or full-sized schifflera actinophylla! Both can reach large sizes if they’re left to their own devices. Shaping to remove leggy growth is also advised. This is especially true if you’re trying to maintain a smaller profile. Pinch back dead or dying leaves to just above a leaf node. This is the point at which the leaves join the stem. Large amounts of dead or damaged foliage should also be removed. Trim them back to 1/2″ above the nearest healthy leaf or stem. A pair of bypass loppers may be useful for this if you have a larger plant. Regular tip-trimming during the growing season will also encourage more bushy growth. If you want the canopy to fill out, this is the best way to do it! Finally, if your trunk or branches seem weak or unable to handle the denseness of the canopy, there’s a way to fix it. Severely trim back these branches to 4-6″ in length. This forces your tree to start fresh with producing more solid branches. Umbrella trees can be propagated via seeds, stem cuttings, or by air layering. It can be a bit tricky to propagate, but worth it! To take a cutting, begin by selecting a healthy leaf stem. It should be a young stem, not particularly large. Sterilize a sharp knife or sharp pruning shears, and clip or cut off the leaf stem near the branch. Dip the cut end into rooting hormone, and then place it into a pre-prepared potting soil mix about 2″ deep. Place it in an area with steady bright but indirect sunlight after watering. It’s best to provide extra humidity around your cutting while it takes root. A clear plastic bag can act like a greenhouse. Alternately, consider using a small cold frame to keep humidity in. Be sure the soil stays moist, but not wet. A few weeks later, roots should have formed. As soon as the plant starts producing new green growth, you can remove the plastic bag. To air-layer schifflera, carefully slice off a thin layer of the outer stem coating on a lower branch. The open area should be bent down to bury it under the soil’s surface. You may need to stake it to keep it in place. Soak your seeds in warm water for 12 hours before sowing. The ideal temperature for your water is 140 degrees Fahrenheit. Use at least four times as much water as the amount of seeds you’re soaking. Once your seeds have had their warm water soak, it’s sowing time. A good potting mix will work. You can also use the Cornell University “peat-lite” mix. This blend is 1 quart vermiculite, 1 quart peat moss, 1/2 teaspoon ground limestone, and 1/2 teaspoon 5-10-5 fertilizer. Plant the seeds twice as deep as their size. Water enough to make your soil moist but not soggy, and keep them out of direct sunlight. Use a seedling heating mat to keep the soil temperature at 75 degrees. You should have high germination with this method. Umbrella trees are hardy, and you shouldn’t run into too many issues with pests or disease. But here are a few to keep a watchful eye for, just in case! The worst issue affecting dwarf umbrella tree indoors are two-spotted spider mites. These annoying little pests create spider-like webbing on the underside of leaves. Spider mites hate humidity. Your first line of defense should be providing plenty of humidity for your umbrella tree. Beyond that, neem oil will repel them from the plant. Another insect which neem oil repels is the aphid. 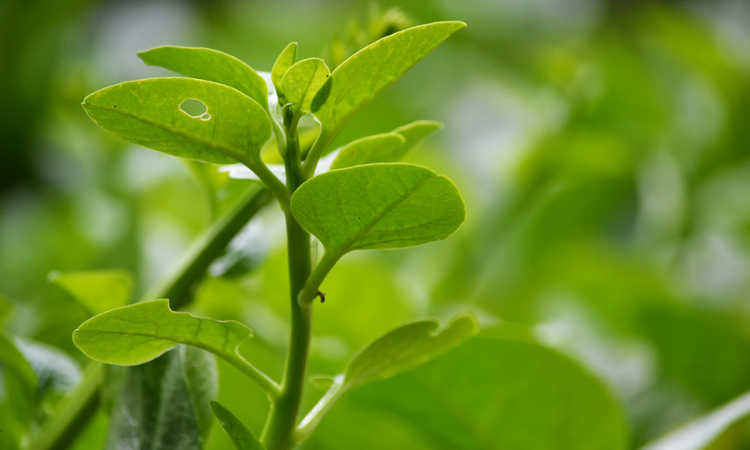 Many types of aphids may prey on schefflera plants, and they all react similarly to neem oil. They stop sucking plant juices from leaves, and if the oil coats them they die out. Scarred umbrella tree leaves may be a sign that thrips have invaded. These thysanoptera pests are hard to defeat as their larvae hide inside plant tissue. I recommend using an insecticidal soap blended with a little neem oil to keep them away. Finally, white mealybugs, a type of scale insects, may move into your plant’s foliage. They don’t move around much, but they can cause some severe damage to your plant in large numbers. Use a cotton swab dipped in rubbing alcohol to free them from your plant’s stems and leaves. 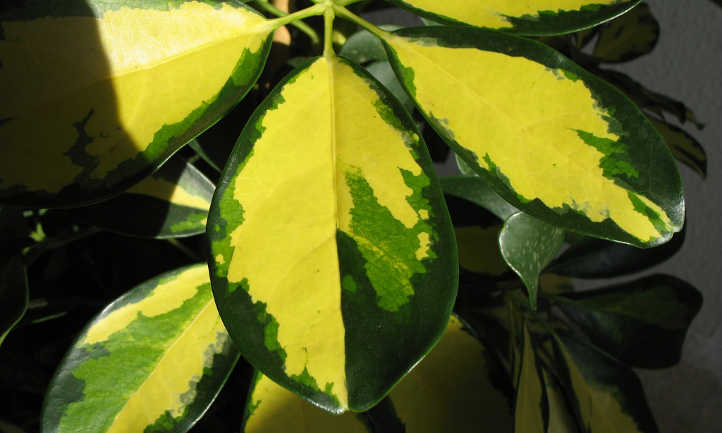 Fungi can cause leaf spots on your schefflera plants. 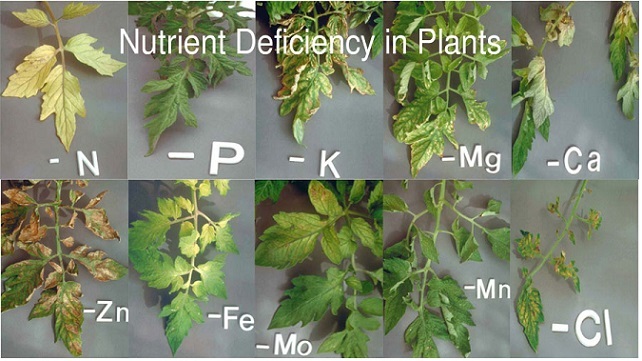 The most common of these is alternaria, but phytophthora fungi can also do it. Both of these leaf spots can be treated similarly. Use a copper-based fungicide to evenly coat the plant and kill the fungi. When aphids attack, they can leave behind patches of honeydew, a sticky secretion. This secretion is the perfect habitat for sooty mold. While sooty mold won’t harm your plant, it can make it hard for the leaves to absorb light. Use a damp cloth to clean off the leaves. A form of bacterial blight known as pseudomonas leaf blight can happen. This can cause leaf drop or water-soaked splotches on leaves. Prune off infected leaves and destroy them. Keep the leaves dry to prevent further outbreak. Xanthomonas leaf spot, another bacterial disease, creates beige-colored spots. These spots can become large patches over time. Prune off diseased leaves and fertilize more regularly to help the plant fight it off. Over-watering may cause fungal growth that leads to root and stem rot. You’ll know this is happening when the roots and stems feel soft and mushy, or the leaves of your plant turn black and fall off. Q. How do I harvest seeds from my umbrella tree? A. For schefflera actinophylla, wait for the strings of berries or seed pods to turn dark maroon. Allow the pods to dry out in the sun completely. You can then put them back into water while rubbing them to release the seeds. Once you’ve gotten the seeds out of the pods, spread them out to completely dry out. The same basic process works for schefflera arboricola. However, arbicola berries turn from orange to bright red when ready to harvest. Q. My umbrella tree is getting too tall, what can I do? A. It’s common for an umbrella tree to get out of control. They grow quickly, but they also recover quickly. If yours is getting out of control and taking up too much space, heavily prune it back. It will start producing plenty of new shoots! Q. What is the easiest way to propagate umbrella trees? A. Schefflera arboricola is known as a hard-to-propagate plant, but there is one way that has a high success rate. Take cuttings, place them in high-quality potting soil in pots. Place these pots in trays of water and place the trays in the shade. As long as the water temperature is warm, you’ll see new shoots in 2-3 weeks. So are you ready to rush out and get an umbrella tree of your very own? They’re really great foliage plants and can really brighten up a room! Do you prefer smaller dwarf umbrella tree or the larger variation? Tell us in the comment section! My plant has sticky leaves. They are shiny and sticky. It sits on a glass table and the table gets sticky. Any suggestions? It has new growth all over, just the older leaves are sticky. We have had this plant for 8 years, have repotted it several times, it is now taller than i am (5’9″) and as big around as a tractor tire if not bigger. It has started sending out roots from above the soil line, alot of roots. Would it be safe to divide the plant? My husband received the plant as a gift when he had cancer, and in his mind, his health is tied to this plant. So, that being said, killing/letting the plant die isn’t an option. I would post pics if i could. I never knew mine was a Dwarf until I read this article while researching different trees with my son for a grade Six science assignment. My umbrella tree was inherited from my late Grandmother in 1989 and while it does get forgotten at times (and not watered) it still grows and looks lush and beautiful! Also I don’t believe it to be poisonous as I know my dogs have eaten the leaves and they are fine. The weight of the branches can be challenging as it pulls the whole tree over so pruning is a must! But overall, it is gorgeous and easy to care for. I hope to see it live on many more years. I have an umbrella plant that is 22 years old & still looks great. I have a healthy umbrella tree that is very tall 5+’ . . .this afternoon my 2 1/2 year old took all the leaves off while I thought she was napping ( oh the bittersweet risk of taking a nap while you’re child is “napping”). . .anyway. . .I was curious to know if you think it will grow them back if I continue to care for it well. . .???? Should I cut it down? Or should i just cut my losses??? Any advice would be great THanks! an umbrella tree ; needs a lot of direct light .if the leaves are turning brown it is getting to much water. i put my plant on my patio all summer ;bring it in side in the winter and put it in front of my patio window for direct light i do not water it all winter as it gets enough water from rain in the summer . ive had mine for a good ten years. I found a parasol plant in the street a month or so ago and immediately took it home to ‘save’ it; it’s about 5′ tall with a fair amount of growth at the top. I repotted it in fresh compost in a pot with good drainage and it stands in a well-lit room out of direct light. I assume as it was dumped in the road whoever owned it previously realised it wasn’t well but I’d hoped a new home and fresh soil would help. However, the leaves have begun to turn yellow and brown and many of them have developed brown lines as though something is chewing away at them. However are no signs of infestation that I can see. It makes me very sad that it’s dying, any advice gratefully accepted! Where I live we have an umbrella plant and it is starting to show nasty sap on the leaves. Please does any body no any thing about these plants. I have tried everything and can not figure it out . Please help me. I have a dwarf umbrella tree for a few years now. It is quite healthy and in indirect sunlight indoors. A few months ago I noticed it leaves seemed to be sweating a type of sticky clear type of resin which then leaves the table where it stands on all sticky. I washed the plant off with water and it was alright for a few months and the leaves (although healthy) have now again started weeping the watery looking sticky type of resin. does anyone have an idea what this is? I’m seriously confused as to the toxicity of the Umbrella tree. I want to get 2 to place in my bedroom, but I have cats and the ASPCA lists Schefflera as toxic to them. 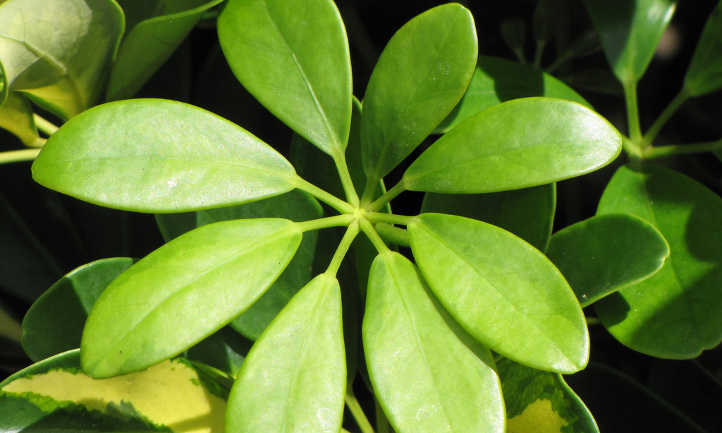 However, some other sources indicate that Arboricola or the Umbrella plant is NOT toxic to dogs or cats! Can someone please help me out so that I don’t go buying a plant that will make my kitties sick?!?!? Thanks. i would call your vet and ask them they should be able to research from the correct sources . well i had jus bought this tree and i am worried bout having little bugs in my house from the tree.. does this happen often??? I have had my dwarf umbrella tree for three and a half years. It was given to me when my first son was born. It was doing really well, then I repotted it and ever sence then it has been dying. The trunks are turning brown and shrivling up. I don’t know what i have done to it or how to save it. I would love any advise any one can give me. Alix the only way I know to try to save a plant that has been over watered is to repot it, or at least take it out of the pot and add new soil. If it’s a big umbrella tree it might not be easy. If it’s had too much water, some of the roots are most likely rotted and decayed. If these aren’t removed it will cause the other roots to rot as well. I would take it out of the soil and remove as much of the dirt as I could from around the roots. Check all the roots and remove any that are mushy and decaying. It probably wouldn’t hurt to leave the tree out of dirt for a few hours and let the roots get some air to let them dry out a little. If you do want to go ahead and repot it, I’d wait a few days before I watered it again. A lot of times even when the soil is really dry, the soil that is clumped around the roots is still wet. It’s like when you have one potato in the bag that’s started rotting, if you leave it in there all the potatoes around will soon start to rot. Hope this helps. I have just been given one of these plants from my friend who has no luck with plants at all. half of it has died, some of the leaves have wilted and drooped, when i took the plant out of its out pot, it was sodden, it looks like it has been over watered. I have taken off the dead leaves, but left on the wilting ones, once the plant has dried out, will these leaves pick up again?.. i have given it a good position in the home..
My aunt gave me this plant as a graduation present and I am horrible with plants anyway I over watered the plant and it is dying how can I save it? I have a couple of several year old Umbrella trees (scheffelerias) that have lost all of its lower leaves and they have no branchs- just leaves off the trunck. Is there a way to may the lower buds develop into branches? They are both 4-6 Feet. they get new leaves at the top but look very “naked below”. I own one of these plants, that I purchased at Home Depot near Dunellen NJ. It is easy to grow, can be grown as a bonsai if you like.